"What are you after, Shmuel? What is this all about?" Good Deed Ent. 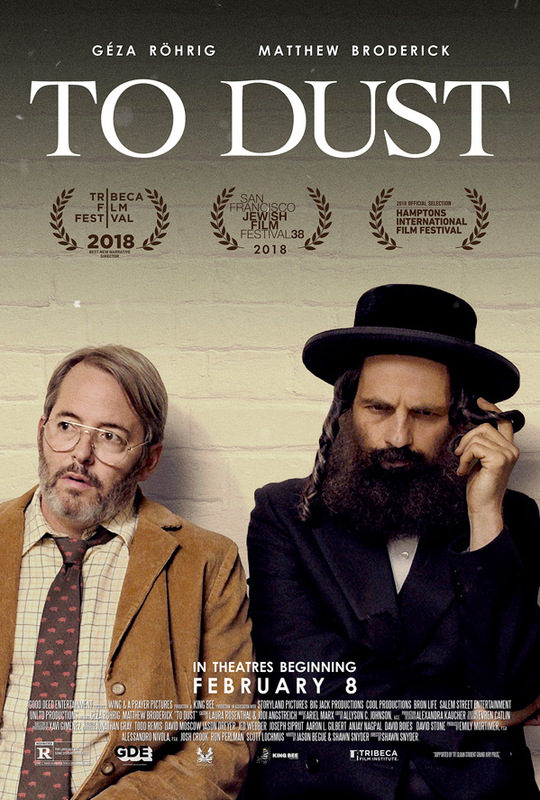 has unveiled the first official trailer for an indie dark comedy titled To Dust, the feature directorial debut of Harvard graduate, singer-turned-filmmaker named Shawn Snyder. The film is about a Hasidic cantor's struggle to find religious solace after his wife's untimely death, while secretly obsessing over how her body will decay once buried. He befriends a local community college biology professor, seeking his help to understand what's happening underground. Géza Röhrig stars as Shmuel, along with Matthew Broderick, and the full cast includes Sammy Voit, Bern Cohen, Ben Hammer, Leo Heller, and Marceline Hugot. This film looks very peculiar but also rather unique and quite amusing, especially with Broderick giving this kind of kooky, quirky performance. Shmuel (Géza Röhrig), a Hasidic cantor in Upstate New York, distraught by the untimely death of his wife, struggles to find religious solace, while secretly obsessing over how her body will decay. As a clandestine partnership develops with Albert (Matthew Broderick), a local community college biology professor, the two embark on a darkly comic and increasingly literal undertaking into the underworld. To Dust is directed by American musician / filmmaker Shawn Snyder, making his feature directorial debut with this after a few other shorts previously. The screenplay is written by Jason Begue and Shawn Snyder. Featuring cinematography by Xavi Gimenez. This premiered at the Tribeca Film Festival earlier this year. Good Deed will release Snyder's To Dust in select theaters starting on February 8th, 2019 early next year. Thoughts?